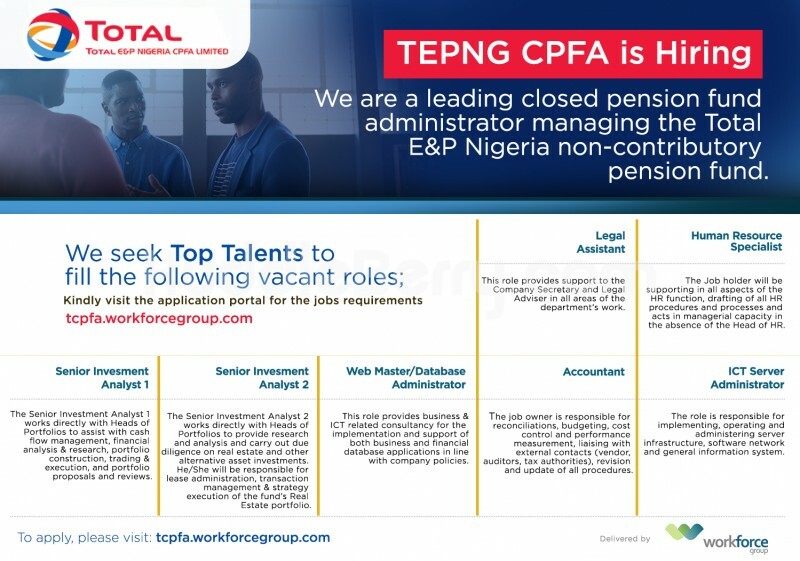 Total E&P CPFA Limited is a leading Closed Pension Fund Administrator whose main objective is to manage the Total E&P Nigeria Staff Non-Contributory Pension Fund. 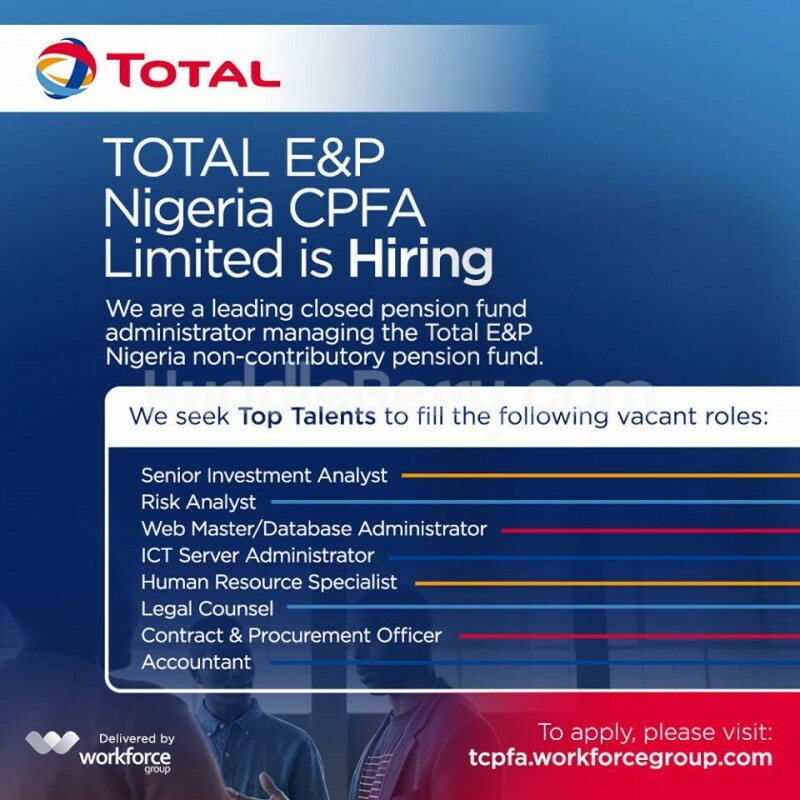 Total E&P CPFA is currently looking to recruit top talents to join their organization and has mandated Workforce Recruitment and Assessment, (a member of Workforce Group and a leading HR consulting firm) with specialization in top talent selection to recruit the following positions. A degree in Computer Science, Computer Engineering and/or Information Systems. Certifications such as PMBOK, MCSE Business Intelligence and/or database architecture design would be an added advantage. LL.B. Graduate, B.L (LLM in Commercial Law, and/or membership of the The Institute of Chartered Secretaries and Administrators of Nigeria would be an advantage) . 6-10 years post graduate experience for a Law graduate with at least 4 years in a Company Secretariat of a Pension Fund Administrator or other Public Liability Company or a Corporate Law firm providing Company Secretariat services to Pension Fund Administrators /Public Liability Companies. BSc degree or equivalent in a numerate discipline. Minimum 5 years post BSc work experience in a HR role. Working experience in the Pension/Financial industry with CIPD/CIPM Certification would be an advantage. Good understanding of Nigerian Employment laws. University Degree in Finance, Accounting Law, Business Administration or any other quantitative discipline. 4 - 6 years relevant work experience, in Supply Chain Management, and/or Contract and Procurement as well experience in Purchase to Pay (P2P) transactions. Chain Management or other professional qualifications (e.g. P2P) would be an advantage. University degree (B.Sc. Or M.Sc.) in Computer Science or Engineering. At least 7 years’ experience within a large corporate or multinational. Key experience in Windows Software, Systems & BCP Administration. IT professional qualifications (MCSE, Microsoft Azure) would be an added advantage. - Implement the Company’s ERM framework and promote a risk awareness culture within the CPFA. - Examine the Fund’s investment portfolios and analyse risk involved in investment decisions. - Project potential losses associated with the Fund’s portfolio and recommend actions to limit risks through diversification and other strategies. - Track and report investment trends and potential impact on the Fund’s portfolio. - Interpret and explain the nature of portfolio risk, including using attribution analysis to explain returns. - Work with other CPFA teams to identify and calculate risk associated with transactions. - Identify and report asset losses, risk exposures and requirements to support the business. - Support risk projects undertaken by external risk consultants and advisers. - Assist in ensuring that rental earnings on the Real Estate Portfolio are optimized in line with guidelines set by the Board of Directors & the Pension Fund Regulator (PENCOM). - Collaborate with other departments including Finance, Legal and Real Estate Projects to ensure that invoices, contracts, budgets, etc are executed in a timely manner. - Conduct market and sub-market analysis on rents, demographics, supply & demand, sales comparable, lease comparable to create informed data driven strategies, programs and methods to maximize the financial and operational return on assigned Real estate portfolios. - Prepare internal presentations, including recommendations for investments in Real Estate and other Alternative Asset investments. - Prepare, analyze, validate and test detailed financial forecasts and feasibility studies for co-investment projects, new investment funds and Real Estate properties. - Provide valuable inputs for the development and execution of individual strategies for properties in the Real Estate portfolio and investment in other Alternative Assets with focus on creating and enhancing value for the Fund within acceptable risk limits. - Coordinate the negotiation of all lease terms with prospective tenants (i.e. rental rates, term, cancellation/renewal options, etc) and work with the Legal team to ensure lease agreements and necessary legal documents are finalized in a timely manner. - Maintain and manage data on existing and prospective Real Estate Portfolio properties and other Alternative Assets investments with emphasis on reviewing and managing performance metrics to guide future strategies. - Assist in the drafting, implementation and maintenance of economics, financial models and frameworks to guide investment decision making in Real Estate and other Alternative Assets Investments. - Provide inputs related to investments in other Alternative Assets and Real Estate for the periodic investment portfolio reporting. - Ensure cash inflows and outflows on Real Estate Investments and other Alternative Assets are received as at when due, adequately monitored and tracked. - Assist in the development and execution of annual Capital Plan & budget for each asset in the Real Estate Portfolio with the aim to increase portfolio value. - Develop and maintain working relationships with Alternative Asset Fund Managers, Real Estate Brokers, Vendors, Property Managers and Facilities Managers, as well as, strategic relationships with tenants in a bid to optimize returns on the Portfolio. - Carry out other specific projects assigned by the Chief Investment Officer. - Ensures the documentation of transaction processing workflows within Finance and Operations department in standard procedures. Also ensuring that existing procedures are updated and reviewed in line with current practices. - Prepare monthly depreciation of assets in line with the accounting policies and procedures. - Prepare monthly amortization of intangible assets in line with the accounting policies in place. - Maintains proper books of account by ensuring that daily transactions are recorded using both the accounting & investment module of the Fund’s software. - Preparation of Monthly, Quarterly, and half yearly & annual fund valuation. - The valuation and updating of fund investment in Private equity & Infrastructural fund. - Forecasting upcoming payment needs of the Company; providing adept analysis of the bank balance vis-à-vis the forecasted payments to ensure adequate funding by the sponsor and also avoiding idle bank balances. - Ensuring periodic (i.e. quarterly) cash call reconciliations with Parent Company. - Ensure that balances held by Parent Company against the company (as represented by debit notes) agrees with Company’s records. Also, identifying any differences that may exist, investigating and resolving them. - Work with departmental managers to develop and prepare appropriate budget for the Fund & company. - Participate in the budget approval process by the board of directors. - Analyse monthly department budgeting and accounting reports to maintain expenditure controls. - Consult with managers to ensure that budget adjustments are made in accordance with program changes. - Provide advice and technical assistance with cost analysis, fiscal allocation, and budget preparation. - Seek new ways to improve efficiency and optimize cost – benefit matrix. - Review operating budgets to analyse trends affecting budget needs. - Examine budget estimates for completeness, accuracy, and conformance with procedures and regulations. - Responsible for the preparation of regular and special budget reports. - Interpret budget directives and establish policies for carrying out directives. - Compile and analyze accounting records and other data to determine the financial resources required to implement a program. - Preparation of the financial statements of the Fund and the Company. - Preparation of the net assets value (NAV) of the Fund on a monthly, quarterly and yearly basis. I write to apply for the ICT Server Administrator in your reputable Organisation. I have relevant experience in building up servers, managing networks, computers and boarding/ offboarding active directory users. I have also in the past year been working on designing, deploying, supporting Microsoft Azure cloud technologies for customers worldwide remotely. I have served various roles in IT departments of ISP and e-commerce platforms and have also worked as a system integrator in the hospitality sector delivering smart home technologies. Kindly find attached, my curriculum vitae for your perusal and necessary action. jibrinrabiu Please click the link for the job position you want to apply or Click here to apply. I wish to apply for this job role in your organization.